Casting around for something I could pre-cook for the family over the Bank Holiday weekend, I was reminded that I had rather a lot of rabbit in the freezer. 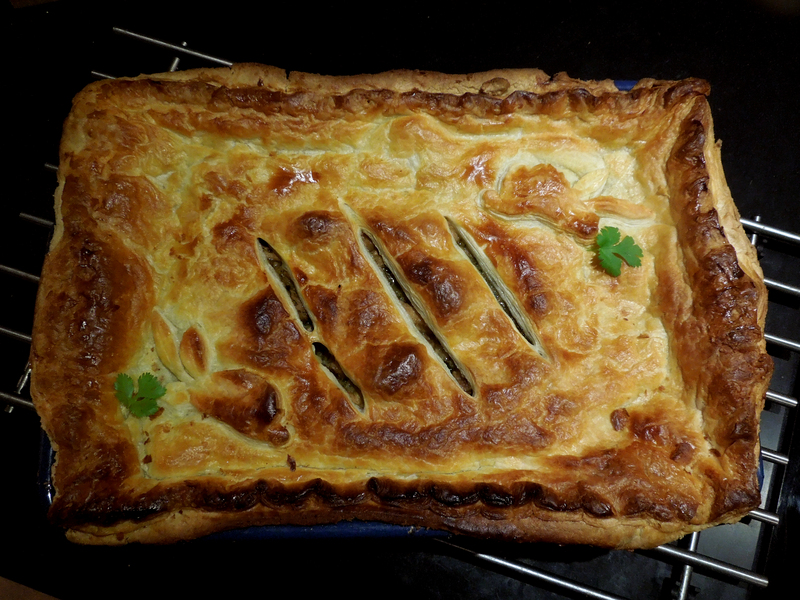 We still have leeks in the vegetable garden so I put the two together, topped it all with a pastry crust and bingo! Supper taken care of. 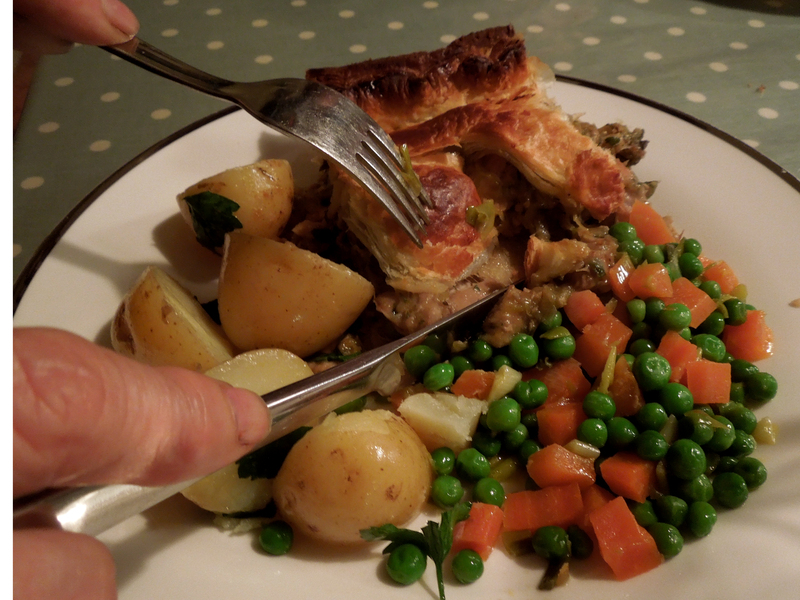 The pictures (the real ones, not my drawing) don’t really do justice to the pie as I’d rather my guests got to eat hot food than wait while I fanny about photographing it. Greed trumps aesthetics every time in this house, I’m afraid. Having said that, this pie eats just as well cold as hot. If you’re too soft-hearted to eat bunny rabbits, you can use chicken. 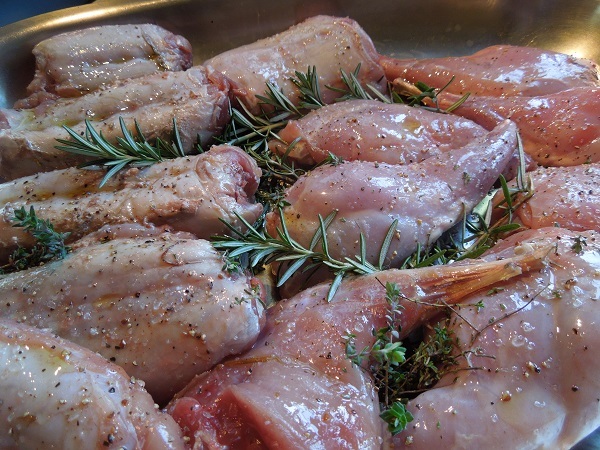 Put the rabbit joints in a roasting tin, season well with salt and pepper and drizzle generously with olive oil. Tuck the thyme and rosemary sprigs among the meat and roast for 20-25 minutes, turning once. The aim is to part-cook the rabbit to make it easier to remove from the bone, while infusing some herby flavours. Once it’s cool enough, take the meat off the bones and cut into bite-sized pieces. Set aside. 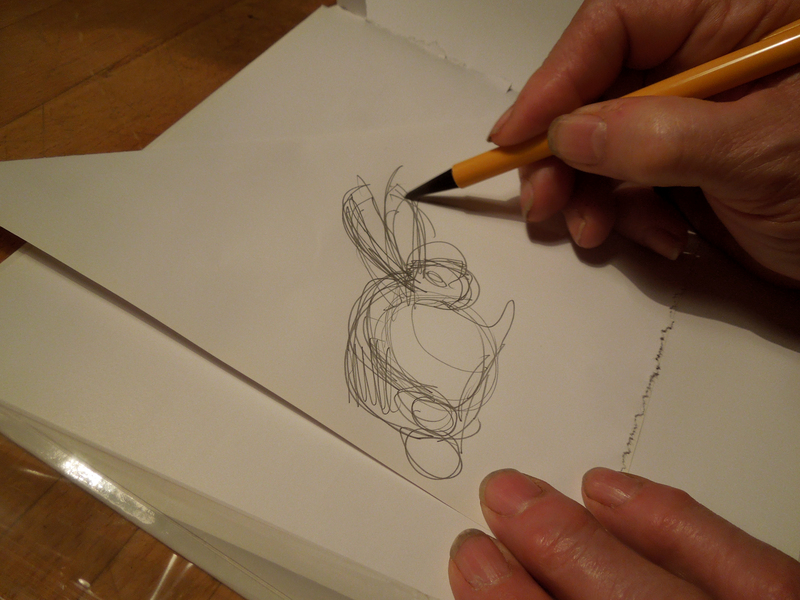 Get your sister in law to draw a free-hand template for the pastry decorations. Put the bones, with any shreds of meat adhering, and the juices from the roasting tin into a large pan with the chicken stock and simmer gently for 20-30 minutes, then strain and reserve the stock. If you want to short-cut these two steps, brown the rabbit in a little oil in a frying pan and remove the bones just before you put the meat in the pie. Heat some oil in a casserole and fry the onion and garlic until soft and golden. 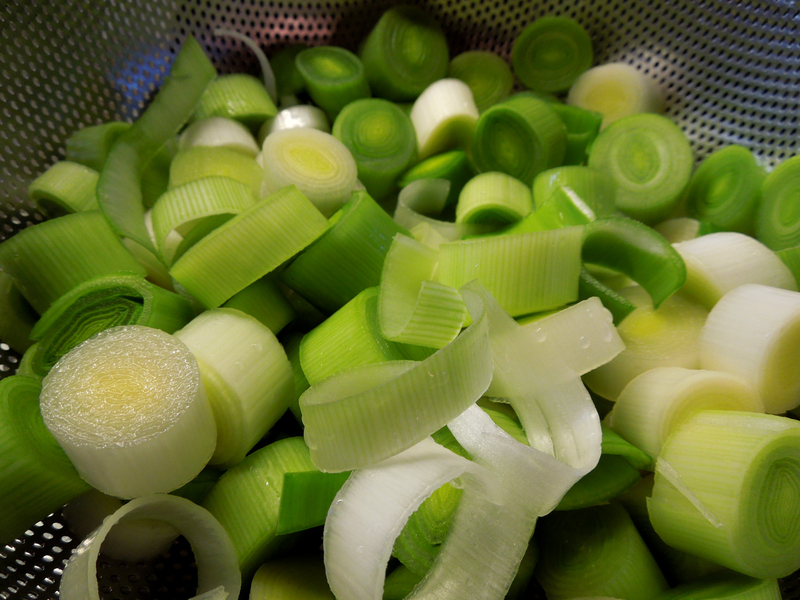 Add the leeks and cook gently until they soften. Now throw in the sliced mushrooms and fry for another minute or two. Stir in the flour and cook for a couple of minutes. Pour in the wine and stir until the mixture starts to thicken, then gradually add the stock, enough to cover the rabbit. Put the rabbit back in the pan, put a lid on and cook for up to an hour or until it is tender. These timings are approximate, as wild rabbit will usually take longer than farmed rabbit and you might have a tough old thumper. Start checking after 40 minutes or so. Check the sauce for seasoning and reduce further if necessary. 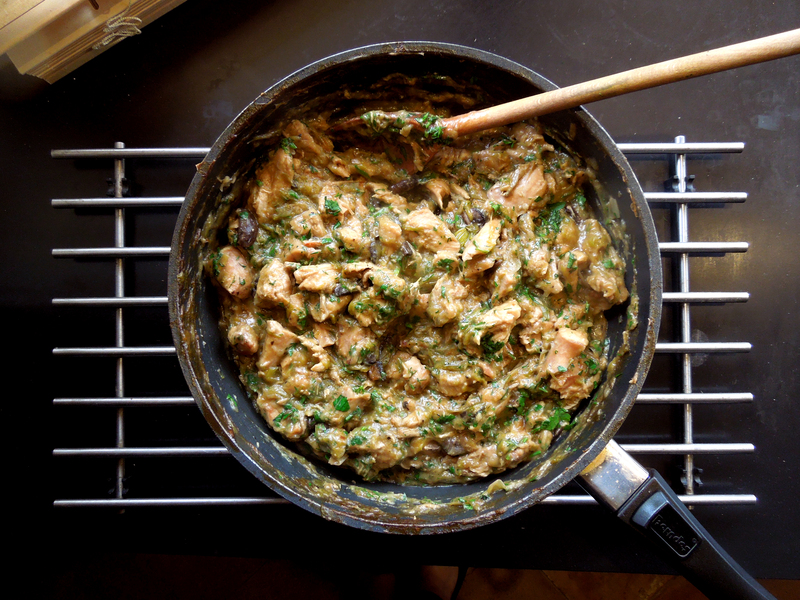 Stir in the cream and mix in the chopped herbs. Heat the oven to 180C/350F/Gas Mark 5 and put a baking sheet in to heat up. If you want a top and bottom pie, roll out the shortcrust to line your pie dish and chill it for 15-20 minutes. When the filling has cooled, spoon it into the pie dish, brush the edges with a little egg wash and top with the puff pastry, pinching the edges to seal. Otherwise put the filling straight into the dish and top with the puff. Glaze with more beaten egg, decorate with any puff pastry trimmings and cut a hole in the middle for the steam to escape. Bake for 35-45 minutes on the pre-heated baking sheet until the crust is puffed and golden and the filling piping hot. If the edges start to catch before the rest of the pie is done, cover them with some foil. Eat and enjoy. 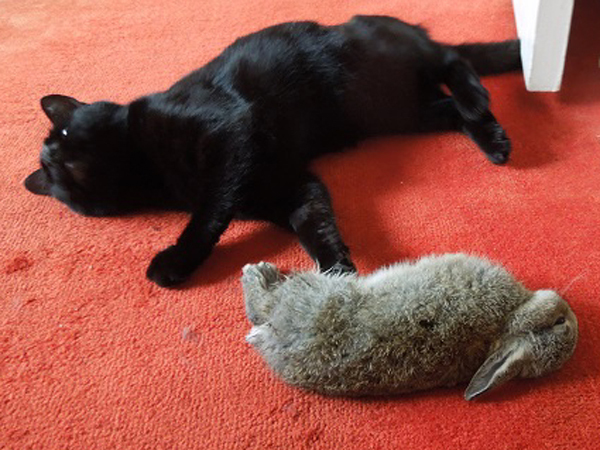 Vandal gave the new kitten her own Easter bunny. This one didn’t go in the pie. 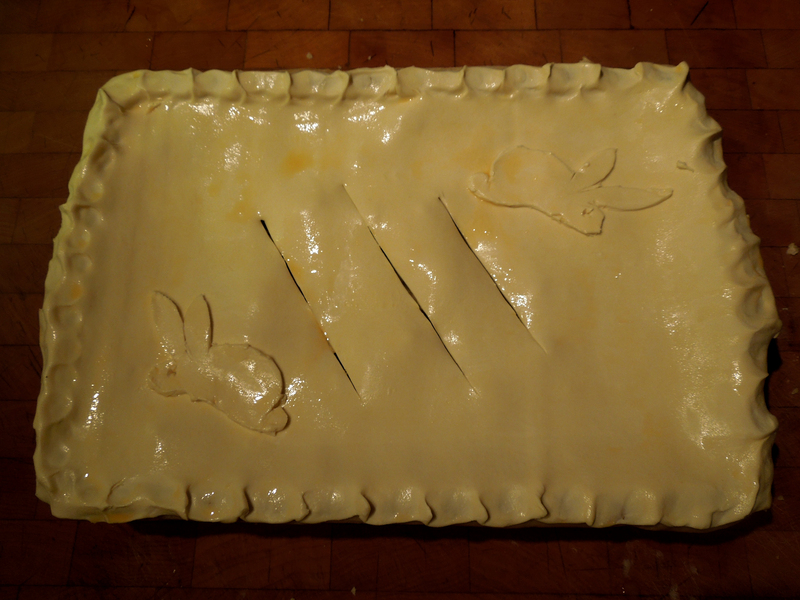 This entry was posted in Game, Mains and tagged Easter Bunny Pie, rabbit and leek pie, rabbit pie, rabbit pie with herbs by Linda Duffin. Bookmark the permalink. 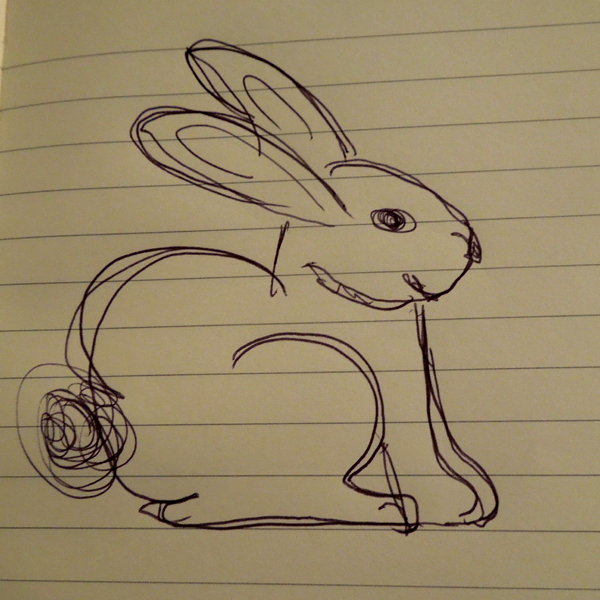 Your cat killed a rabbit. How could you! Nice pie. I love the herb quantities. Forgive me Easter Bunny, but that looks so delicious! I’d rather have this than a chocolate Easter egg! Thanks, Michelle and belated happy Easter. Can’t persuade Him Indoors to eat rabbit. Too many bones. Sez he. Perhaps I could sneak one through in this pie?